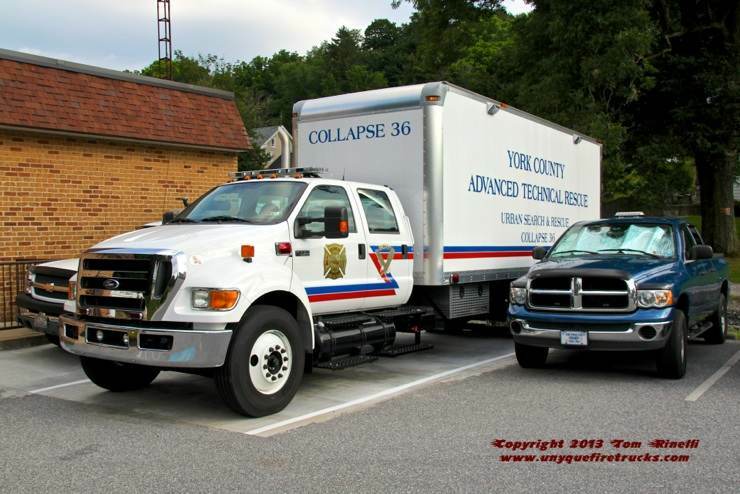 Jointly operated and staffed by the Yoe, Shrewsbury, Dover Township and Hanover Fire Companies as the York County Advanced Technical Rescue Team, it replaced a 1990 Volvo/Hackney two door rig with a roll-up walk-around body. Featuring a lift gate, it is equipped for trench, confined space, rope and water rescue operations. 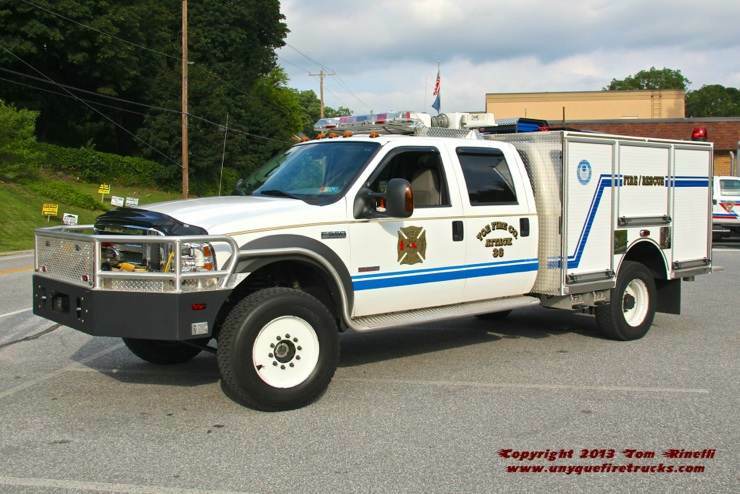 Attack 36 - 2005 Ford F550/Firematic B.R.A.T. 300 gpm/300 gal. 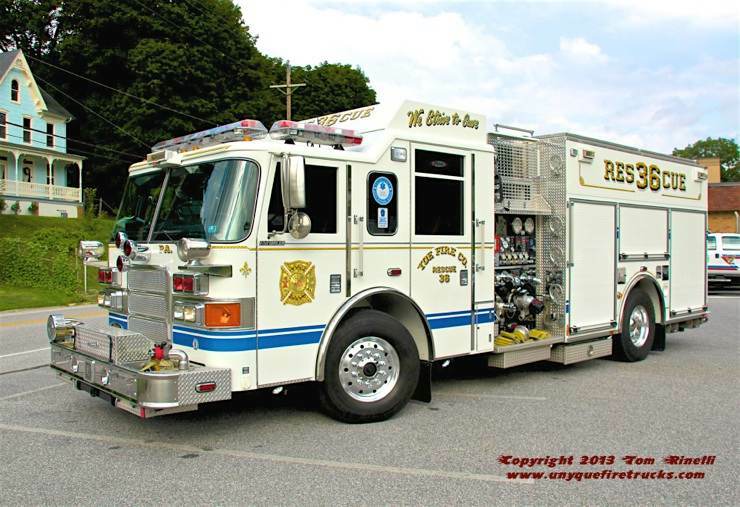 Featuring “Super Single” tires, it is equipped with an extended bumper and brush guard, a Hale 30FS pump producing 300 gpm @ 150 psi for pump & roll capability, front pass through compartment, “NightScan Chief light tower and dual electric reels with 150’ of 1/4” wire. The cab features Firecom headsets, two SCBA seats and controls for the generator and light tower. Its’ equipment complement includes two 1-1/2” front trash lines, two 1-1/2” rear pre-connects, a 2-1/2” direct discharge, a 300’ 3” “deadlay”, 16’ ladder, 5,500 watt portable gas generator and a Stokes basket. 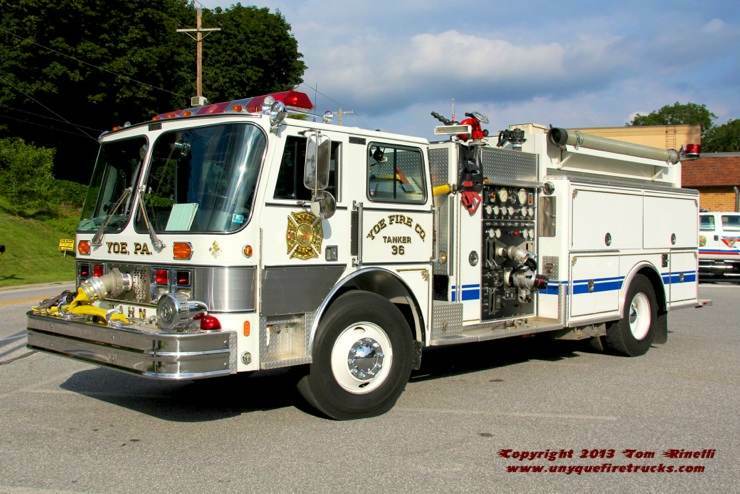 Tanker 36 - 1988 Hahn/Firespire 1500 gpm/1500 gal. Operating as a certified heavy rescue through the York County Fire Chiefs & Firefighter’s Association, it features an 8,000 lb. portable winch with four receiver points, NightScan light tower and two 6,000 PSI cascade cylinders. Holding the distinction of being the third fire company in York County to carry extrication tools beginning in 1973 when donated by the ladies auxiliary, Rescue 36 is equipped with four pre-connected Hurst extrication tools (3 reels and 1 coil). Special thanks to FAO Ben Rodkey for positioning the apparatus for photos, Yoe Fire Co. EMS Paramedic Supervisor Matt Giacopelli for arranging this visit and FAO Kevin Gibney for providing detailed specs on Yoe’s apparatus fleet. 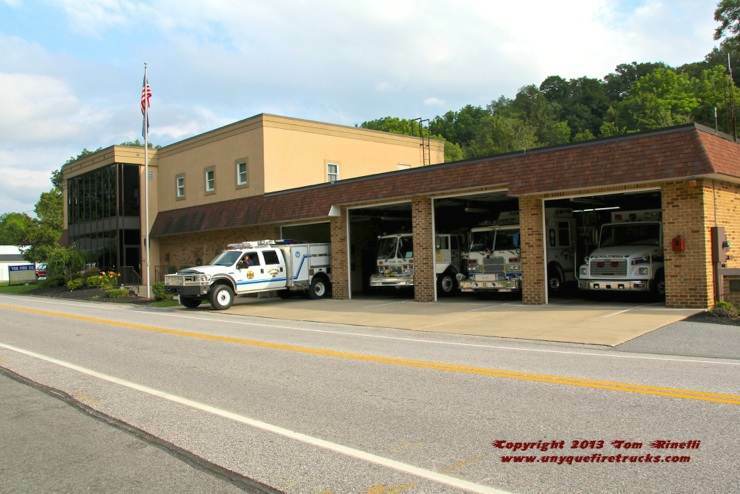 Yoe operates their entire fleet from this four bay firehouse. The bays are an extremely tight fit which the fire apparatus operators describe as “like backing into a cave”. 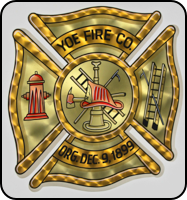 Organized in 1899 as the Citizens Fire & Hose Co# 1, the company was reorganized several times into the present day Yoe Fire Co. The department’s volunteers provide Fire & Rescue services answering 300 alarms annually with Yoe Fire Co. EMS, a combination service handling 4,100 runs per year. An unusual piece of apparatus history involves a 1922 Reo/Childs engine that sometime between 1955 to 1957 was stripped of all its’ stained glass and kerosene lanterns and burned in a field!! !